Monoprint versus Monotype. What is the difference? Monoprint versus Monotype. Argh! What is the difference? This is something that has confused me for years, but until now (I’m a little embarrassed to admit) I haven’t had the inclination to properly understand the difference. However, I have been invited to be a part of a postcard print exchange, and one of the printmaking media is monoprint. Now I think it’s the time to properly understand the difference between the two media. During this educational process, I learned that I have been using the term ‘monoprint’ incorrectly. In effect, what I had previously termed ‘monoprint’ is actually a ‘monotype’. Hmm. Time to update category titles in my artwork gallery. Finding a definition that was clear to me was tricky. It took me a while to wrap my head around it, but now I think I understand. Note: If, when reading this, you find that I have understood the definitions incorrectly, please let me know. 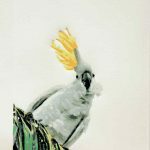 A monoprint is a one-of-a-kind print that forms part of a series. Much like an ‘edition variable’. Each finished print varies to the other, but a common element is present in each print. For example, a collagraph could be the common element, but each print is inked differently, chine collé applied in one or a few of the prints, and different marks made by subtracting or adding ink and texture in addition to the base collagraph plate or matrix. A monotype is a one-of-a-kind print that will exist in its own ‘unique state’. It starts with a clean surface (for example: glass, gelatin plate, perspex), then adding ink or paint and working the surface to create an image before taking an impression on paper. This technique works beautifully when adding layers of colour and texture to the one print. 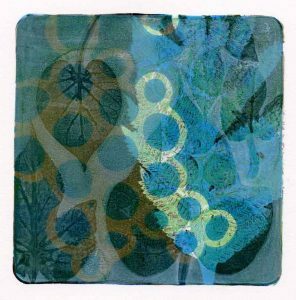 The images below are layered monotype prints created using gelatin plates and acrylic paint, using different organic matter to create the image. Both processes present endless opportunities for experimentation. 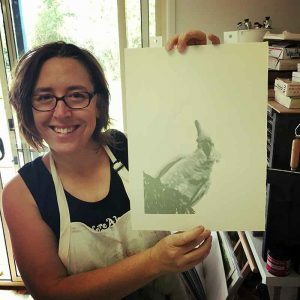 I love to experiment with different techniques – for me it’s how I learn about printmaking in all its varied forms, and how I develop my own skill and find my own style. I suspect though that the skill and style development will be a lifelong learning. Pure bliss! A monoprint is one of a series—therefore, not wholly unique. 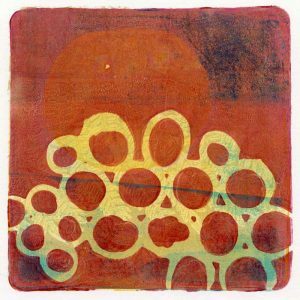 A monoprint begins with an etched plate, a serigraph, lithograph or collograph. This underlying image remains the same and is common to each print in a given series. Other means of adding pigment or design are then employed to make each print in the series slightly different. The series of monoprints has a limited number of prints and each is numbered. A monotype is essentially ONE of a kind: mono is a Latin word which means ONE and type means kind. Therefore, a monotype is one printed image which does not have any form of matrix. On the other hand, a monoprint has some form of basic matrix. 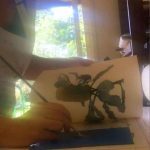 The process of creating a monoprint or a monotype is the same, but when doing monotypes, the artist works on a clean and unetched plate; with monoprints, however, there is always a pattern or part of an image which is constantly repeated in each print. Artists often use etched plates or some kind of pattern such as lace, leaves, fabric or even rubber gaskets, to add texture. In this case, having a repeated pattern, we have a monoprint. Interested in a Monotype workshop? 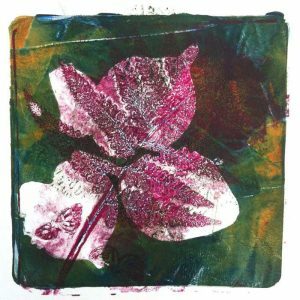 Monoprint and Monotype printing is fun, easy and contagious! Attend a one day workshop with me where you will play with found and organic shapes and objects to produce a series of monotype prints. You will learn how to take both a planned and sponantious approach to this printing method. You will also learn how you can apply this printmaking technique to other surfaces such as fabrics, and how you can continue at home with minimal investment in materials. A simple and fun approach to monotype to explore is working with gelatin plates. You can make the plates yourself, or buy them online (Gelli Arts) from various shops. A quick Google images search for “examples of monotype” reveals a host of different styles and approaches to creating monotype images. I did the same “examples of monoprint” search, but you’ll see some of the same images in both searches, so you may need to drill down into different pages to know if which images really are monoprints versus monotypes. I have a Pinterest board with a mix of monotype and monoprints. Have a look and see if you can see if you can spot the monotype versus monoprint prints. I’ll finish here with a delicious 1970s video showing the art of marbling paper. It is in effect a monotype process. I look at the effect and see it as ‘old fashioned’, but at the same time I’m excited to give it a go and add it to my repertoire of printmaking skills. I’ll experiment and add my own twist, but the process and hands-on approach is so appealing to me.